I’m thinking about doing a cookie recipe swap in the next few weeks. I’ll post a recipe on my blog and then you can share one in the comment section or share a link back to your blog with your cookie recipe. Hopefully, your recipe will be one that you’ve tried and still enjoy. It doesn’t have to be an original recipe. If you use someone else’s recipe, please try to give credit to the creator if possible or reference the cookbook. I look forward to your participation. It’ll be kind of sad if I post a recipe and don’t get any recipes back. So, start searching through your cookie recipe stash! This past weekend we took Princess to a neighbordhood schoool’s children’s fun fair. It was geared toward children aged 2-12 years old. It was the first year attending so I was pleasantly surprised at the variety of activities offered. Most of the activities were run by the students of the school with the help of parents and teachers. Some of the games included Fish Pond, Duck Pond, Tic-Tac-Toe, Ring Toss, Bowling, etc. There were also activities like bead making, face painting, petting zoo, pony rides, giant checkers, tricycle obstacle course, and painting. I know there were many more things going on but we probably missed a bunch of them. Princess’s favorite game was the Duck Pond. 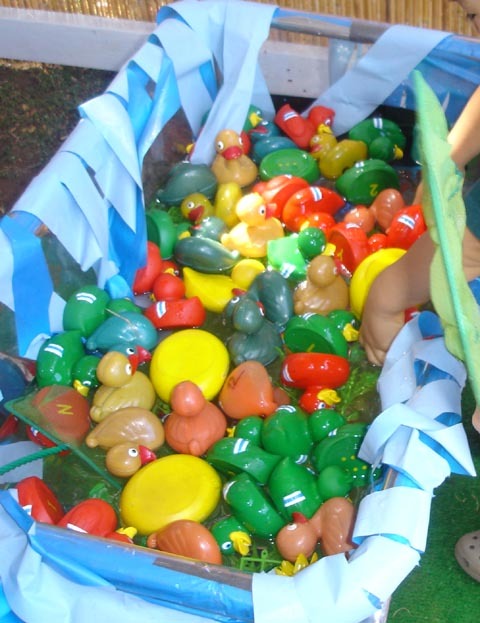 For this game, you’re given a fishing net and you have to scoop as many rubber ducks into the net. Her prize was a little necklace. She wasn’t really interested in the necklace. The best part was just playing in the water! She also enjoyed the tricycle obstacle race. Mr. MaD was a little tired for that one since he’s the one that to help push her around the track in the hot sun! 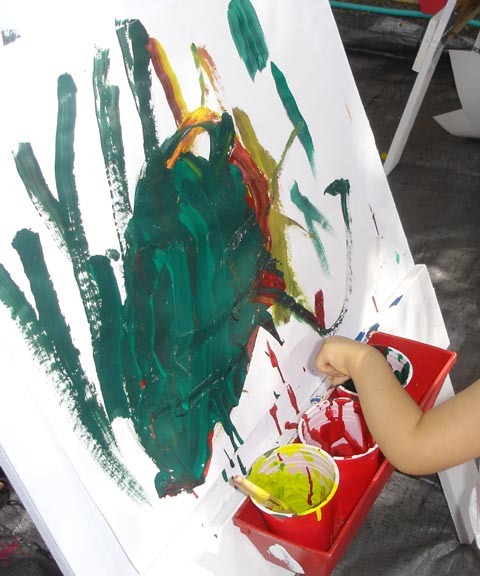 Here are some pics of Princess at the Duck Pond and painting her “masterpiece”. Princess really enjoyed the petting zoo. She was able to see and pet a dog, rabbit, and sheep. In another pen, there were goats. The pony ride included 2 big horses and 1 pony. Of course, the line for the pony was very long so we didn’t want to wait around to get on. Mr. MaD suggested we wait until next year so that Princess has the option to ride the big horses too. We visited the general store and the holiday store. At the general store I was able to purchase some yummy baked goods like Triple Chocolate (Ghiradelli) Chip Nut Cookies. The holiday store sold a lot of Christmas, Thanksgiving, and Halloween stuff. There were a lot of inexpensive items for children, things that’d you’d find at a dollar store. There was also a Scholastic Book Fair happening at the same time. We decided to have lunch at the fair. They offered a delicious taco salad. Other food offerings included the usual fair of hotdogs, hamburgers, popcorn, cotton candy, and some other local favorites. It was a fun-filled day! I know that we’ll make every effort to visit this fun fair next year. I heard that this is a 40-year tradition for the school. I hope it continues! When Princess was born, everyone told us to sign up for preschools right away or at least put her on the wait list. As it turned out, we waited until she was around 1 year old before we finally applied for some preschools. After making some phone calls and receiving some information from various preschools, we decided to apply to 3 different schools. Two of the schools that we applied for were also recommended by friends whose children attend there. Both schools are considered academic.The 3rd school is not considered academic but they do have an academic curriculum in their program. The 2 academic preschools have extensive applications. One of the applications was approx. 4 pages long with very detailed questions. The 2 academic preschools also have “interviews” before acceptance into the program. The 2 academic programs are also Christian based preschools. The 3rd non-academic school does not have an interview process and acceptance is on a first come first served basis. The 3rd school is also the least expensive. We were able to visit 2 schoos, one of the academic schools and the non-academic one. After visiting the academic preschool, we had mixed feelings. The school is very structured. A comment was made by the vice-principal that the children need to be able to sit and listen to the teacher. Hmmm….that sounded reasonable except that these children are only 3 years old and have short attention spans. The classrooms were not necessarily print-rich environments. The students didn’t necessarily seem like they were engaged in any real hands-on activities. I was able to review the workbooks used in the classroom and was not very impressed. My girlfriend who recommended this school said that it was good for her children because she didn’t have time to work with them at home. The other school we visited (the non-academic one) was less structured. Princess was allowed to attend this visitation. The environment was extremely child-friendly. While in the office talking to the principal, Princess was given books and magnets to play with. During the tour, we were allowed to visit classrooms and many of them were very child friendly. We enjoyed the artwork on the walls and the learning centers in the classrooms. We did review the curriculum calendar as well as some of the books. Although, the curriculum is less structured and less academic the children are still learning the “basics”. Princess thoroughly enjoyed her visit. She even wanted to play in the dress-up center with the other children and she was interested in the colored water bottles in the science center. So what’s a parent to do? The school that we did not visit yet is actually our 1st choice. It came highly recommended by many people. Although it is academic, the teachers are very loving and the class size is very small. The major comment made by most was that is was like a family environment. We hope to visit this school at the beginning of next year. Our 2nd choice is the non-academic preschool since Princess really enjoyed her visit there. It seems like she would be happy to attend that school. Our last choice is the academic school that we visited. Today we received a letter from the 3rd choice school. The letter stated that we would be contacted in January 2008 to schedule our interview. Included with the letter was a Teacher Recommendation form that needs to be filled out by the end of November if your child is attending school now. Since Princess is not attending school, we will not be filling out that Teacher Recommendation form. But I can’t help feel like I’m applying to a private grade school with these intense applications, teacher recommendations, and interviews. I am so glad that Princess is too young to understand in case she doesn’t get accepted. She won’t have to face the rejection. Whew! Some of you may be saying that rejection is a fact of life. I agree but not at 2 or 3 years old! Gee, I guess maybe the parents have to face the rejection if their child doesn’t get accepted to the preschool of choice. Will it be a reflection of us and our parenting? I’m not sure about that. I remember a conversation with Mr. MaD’s cousin. Her daughter was not accepted to one of the more prestigious private schools in the area. She applied for kindergarten. It was recommended to her that she should have her daughter tutored (at the age of 4-5 years old) so that she can possibly reapply if she is interested. My goodness…how competitive school is for these children. I remember when I was only 4 or 5 years old. I was still having fun! I wonder when we stopped letting children be children? I hope that when Princess attends preschool she will still be a child and still enjoy her childhood. I would hate to see her lose her sense of innocence, wonder, and creativity just because she did or didn’t attend the “right” school. In a recent post I mentioned my adoration for Starbucks gingerbread latte, well I’d like to mention some other food finds (not all healthy) that I’m enjoying lately. Some are new and some are not. Indulge me, please. Some products are easily found locally and some are not. I hope you have a chance to try some of these, if you haven’t already. The mail arrived today…yes, the box with the Lock & Lock Bento Sets. I have 2 blue bento sets and 2 orange bento sets. I also asked them to send me 2 Lock & Lock divided containers which I think are so useful, either for food storage or for bento. I haven’t decided whether I’ll put any up on ebay. In the meantime, if you are interested in the Lock & Lock bento set, please email me to let me know. My email is middleagedmom42(at)gmail(dot)com. Mr. Mad just told me that my in-laws invited us over for Thanksgiving dinner along with my mother and my aunt and her family. The upcoming holidays has got me thinking about my dysfunctional family. I know I’m not the only one with a dysfunctional family. The fact is that I have a lot of friends with similar experiences. The reasons for the dysfunction vary but for the most part many of the problems arise out of money problems. Sad to say…maybe money IS the root of all evil. In my case, there are many reasons why dysfunction exists. I do remember that when I was younger I promised myself that I would not let money get in the way of myla with my brother, esp. since I have only 1 sibling. The dysfunction really exists between my mother and one of her siblings and between my father and one of his siblings. By the way, my parents are divorced and my father is remarried and lives in another country. Sadly, the dysfunction between my parents and their siblings has affected us (me and the cousins and our children). How you ask? Well, ever since my grandmother passed away we have never gotten together as a family – my mom and her siblings and the children. The last time we were all together in one place was my grandmother’s memorial service. Too sad! If we do have a “family” get together, it usually means someone is left out. I remember a comment made around the time of my grandmother’s illness. It was something like, “Once grandma dies, we won’t see each other anymore.” This is probably more true because the sibling that my mother and aunt don’t get along with lives at my grandmother’s old house as does one of my cousins. So we rarely, if ever, see them at all. As for my dad’s side of the family, it is very similar. I remember attending Mr. MaD’s uncle’s funeral. I had never met this uncle. Why? Well, it’s because this uncle had a falling out with Mr. MaD’s father and uncle. So, they never spoke to each other since the dreaded falling out. The sad fact is that for most families dysfunction seems almost normal. There is hardly ever a chance for reconciliation since most people are either stubborn or unforgiving or both. Isn’t it funny how we find it so hard to forgive family members? Maybe it’s because we have higher expectations of them. It’s easy to forget that in the end we only have 1 family. Yes, I know I have my own family now – Mr. MaD, Princess, and baby. But, I mean the extended family of parents, aunts, uncles, and cousins. I wonder if things will ever change? I wonder if it will only “end” when someone passes away? That would be so very sad! I know that at this point in time, I must let go and let God. I also know that scripture says, “If it is possible, as far as it depends on you, live at peace with everyone.” (Romans 12:18) I hope and pray that my family will find reconciliation and God’s peace, for the sake of OUR children. I just had a conversation with my girlfriend who has a son that’s 2 years old. 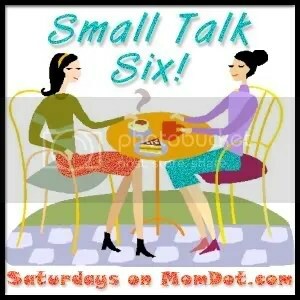 The conversation consisted of the usual topics – eating, discipline, sleeping, tantrums, etc. The major issue that seems to be arising with her son is sleeping. He just recently turned 2 but is able to climb out of his crib already. This has been a big problem because once out of the crib he is able to open his bedroom door and leave his room. Apparently, they have a door handle rather than a door knob. So, he just pulls the handle down and the door is open. Often times, he will leave his room when he wakes up during his nap or at night. I’ve suggested a crib tent but she is not comfortable with the idea. We’ve discussed the use of a gate in front of the door to keep him in his room. She said that another friend suggested holding the door closed when he tries to open it but that’s kind of difficult if it happens in the middle of the night. Another suggestion is to change the door handle to a door knob so that he will at least stay in his room. A comment that arose out of this conversation was that her friend’s doctor is older so he comes from the old school of thought…very straightforward and strict. The doctor is the one who suggested that her friend hold the door closed to keep her child in the room. My girlfriend says that parenting styles were different back then and that since the doctor is older he comes from the old school. She claims that her own pediatrician is more leanient (since he is younger) although she has never discussed this sleep issue with her pediatrician. My thoughts are that if her son waking up and leaving the room is a problem then she should “fix” it. I suggested that she “fix” it sooner than later. Children learn quickly what is acceptable behavior so I’m sure he has learned that it is okay to get out of the crib and go look for mommy or daddy. The funny thing is that as a child I knew who I needed to listen to and who I needed to show respect to. I listened to my parents and grandparents. There was no such thing as “talking back” to your elders. Another funny thing is that in the “old” days there weren’t very many parenting books around. Now, there are hundereds of parenting books with hundreds of options on how to “handle” your children. Yet, we as parents are still confused about how to deal with the everyday issues of raising our children. P.S.S I apologize if this post is a little long-winded and confusing, I’m writing after taking benadryl so I’m a little drowsy.